A typical day’s stillwater fly fishing always starts the same when I get to the water’s edge. Shuffling through the aquatic vegetation and sweeping an aquarium net through the margins in search of potential menu clues for the day’s fishing. Of all the available prey items found in lakes damselfly nymphs are a constant during my shoreline foraging. Trout rummage with similar results too. With a lineage tracing backing to the beginning of recorded time damselflies have been a stillwater or slow moving stream staple for thousands of years. North America is home to 3 damselfly families, Calopterygidae, Lestidae and Coenagrionidae, the most widespread of all with close to 100 different species. Calopterygidae and Lestidae have a more stilt like look to them as nymphs and the Lestidae labium extends back between their legs. Damselflies feature an incomplete lifecycle consisting of egg, nymph and adult, typically taking 1 year to complete. Some species are capable of multiple broods within a season but these are rare. Female damsels use a variety of egg laying methods. Some, often still attached to their male partner, dip their abdomens into the water allowing their eggs to sink to the bottom. It is common for one or both damsels to become entrapped during this process. Pinned in the surface film the adults quiver until dead or fall victim to the swirl of an opportunistic fish. Others crawl beneath the surface encased in a glistening bubble of air and using the tip of their abdomen cut a slit into the aquatic vegetation to deposit their eggs. Once their egg laying mission is complete they release their grip bobbing to the surface and hopeful freedom. Foraging trout within range of this shinny meal are quick to pounce. In rare circumstances, a few species lay their eggs above the waterline in or on overhanging vegetation. These eggs hatch into a minuscule pro larva looking nothing like the slender damsel nymphs most fly fishers recognize. Upon hatching the pro larva undergoes an instar almost immediately transforming into its familiar nymph form, scampering into the water to complete its nymphal cycle. 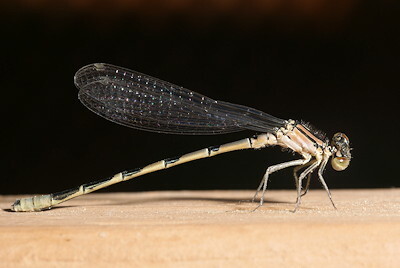 Unlike their stout robust dragon fly cousins damsel nymphs are skinny and demure. 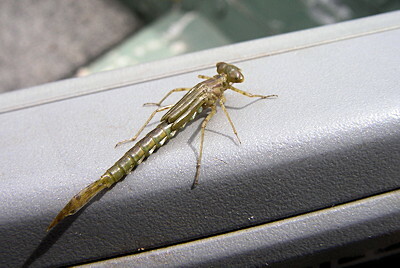 The head is the widest damsel nymph feature as the abdomen tapers rearward to point. Successful fly patterns must take the slender profile into consideration, particularly in selective circumstances. Large prominent eyes are located on each side of the head which the damsel puts to good use when hunting. Just about every damsel nymph pattern features eyes but they are not always necessary, especially when imitating juvenile nymphs. Popular eye materials include metal beads, bead chain, glass beads and melted or pre formed mono. At the tip of the abdomen are three paddle-like tails or more appropriately caudal lamellae that are part of the damsel’s breathing system. Damsels sway their tails back and forth through the water drawing oxygen. Should the damsels loose their tails they can still survive. Observing damsels in aquariums scuds seem to enjoy nibbling the tails, perhaps they are the stillwater equivalent of nachos? Who knows? Steady, capable swimmers damsel nymphs scull about, legs outstretched using an exaggerated snake like motion commonly referred to as sinusoidal. This plodding motion is taxing and the nymphs rest often during their travels. Mobile animated materials such as marabou, rabbit and after shaft feathers used in conjunction with strategically place weight suggest their unique swimming motion. At times, particularly during emergence, trout can become so selective to damsel movement they seem almost uncatchable. Try using a Non-Slip loop knot to inject attractive swagger to any damsel presentation. A steady five turn handtwist retrieve with prolonged pauses works well during their en masse subsurface trek or when suggesting nymphs moving from one ambush location to another. Using a steady 6-12 inch pull in conjunction with a subtle rod shake Gary Borger popularized the strip tease retrieve for suggesting damsel nymphs. Damsel nymphs grow through a series of 10 to 12 instars reaching approximately 1-inch at maturity. Many tiers favour long shank hooks ranging from #8 through #14. Larger patterns should be considered during and just prior to emergence. 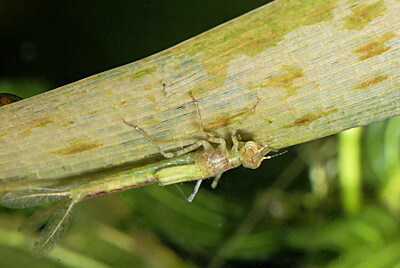 Tiny immature nymphs are often confused with Callibaetis nymphs so a measure of inspection is a valuable investment. 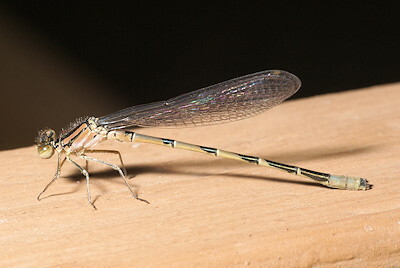 Knowing the difference between the two is invaluable, especially during the early spring and fall periods when immature damsel nymphs are a favoured menu item. Damsel nymphs prefer dense weedy environments in water, often 10 feet deep or less. Long stemmed aquatic vegetation such as Potomogeton is favoured damsel territory. Here, damsel nymphs hang inverted on the undersides of the leaves waiting for food to pass by. Fierce efficient predators, damsels their under slung slingshot hinged labium, consuming all manner of prey including zoo plankton, scuds, mayfly nymphs and chironomids. Coloration is varied and widespread from region to region and within a given body of water. Discovering 3 or 4 different color schemes in one swoop of a sampling net is common. Nymphal colors include brown, tan, olive, tan and various shades of green. Immature nymphs tend to be lighter than older mature nymphs as they darken after each instar. Clear lakes, as with most aquatic invertebrates, are home to pale nymphs. Nutrient rich algae type lakes are often home to green or olive nymphs where as tannin stained waters feature brown and olive. Using aquatic vegetation color as a guide is a sound strategy as nothing appears constant at times. In North America damsel emergence typically runs from late May through mid July, depending upon water temperature, elevation and latitude. The cooler, the higher and the further north the more delayed the hatch. Water temperatures in excess of 60F trigger the strongest emergences. In the final instar damsel wing pads are quite pronounced and swollen, worthy of imitation. As the hatch cycle first starts vanguard nymphs signal the initial stages. When conditions are ideal such as warm mid morning to afternoon periods damsel nymphs plod their way shoreward in staggering numbers just beneath the surface. Silhouetted against the sky, marauding trout feast on the hapless nymphs taking them in bold aggressive swirls. Trout can become selective to both direction of travel and the swimming motion of the nymphs. Presentation positioning is often critical to success. Patterns must travel in the same direction as the rest of the horde to be accepted. Floating, intermediate or Midge Tip style lines are preferred, enabling fly fishers to mimic the shallow horizontal migration of the nymphs. These line choices can be the difference between success and frustration during intense damsel emergences. Upon reaching the shore, emergent vegetation, rocks, loges or even anchor ropes damsel nymphs crawl from the water to emerge. During suspected emergence periods clues of recent damsel activity can be found through a quick inspection of the shoreline area for the cast nymphal husks. Once clear of the water the damsel waits for its exoskeleton to harden. A split forms along the thorax and the adult crawls out. At first glance the newly hatched adult or teneral is a carbon copy of the nymph. After a while a distinct change takes place. Body and wings magically telescope to length as the adult pumps body fluids until reaching approximately 1 ½ inches. Most adult damsels hold their two pairs of long narrow wings along the back differentiating themselves from their larger dragon fly cousins who hold their outstretched, like helicopter rotors. Depending upon environmental conditions such as air temperature the emergence process takes time, up to 2 hours in some instances. During this transformation adults are extremely vulnerable. Many fall victim to ants, birds and amphibians. Under certain circumstances patrolling trout bump and rub emergent vegetation knocking the hapless tenerals into the water. A quick turn and lunch is served. Dropping adult patterns tight to the tulles amongst the swirls often results in spectacular hook ups as panicking trout bolt for deep water or a sprint through the tulles, typically costing both tippet and fly. Exciting and brief, it is fun while it lasts! Adding the odd twitch to suggest a struggling teneral draws fish to the fly converting them into confident takers. 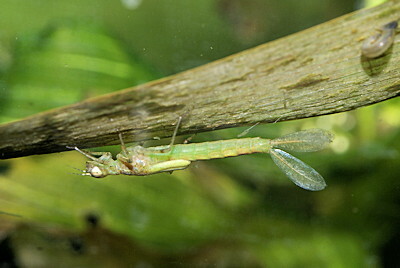 This technique works whenever adult damsels are on the water including egg laying. Damsel adults come in a kaleidoscope of colors depending upon location, species and development. Tenerals are often a pale green or mustard brown transforming into their true colors later. In the west, blue with distinct black banding is common. Other colors include black, maroon and light olive. Adult damsels are competent pilots and predators surviving two months or more after emergence. Darting above the shoreline margins grasping mosquitoes, chironomids, mayflies and other winged insects. Damsels hold their prey using their legs as a basket as they consume their prey, often on the fly. Mating occurs within a few weeks of emergence. Aggressive lovers, males gasp the females behind the head using a specialized pair of abdominal claspers. The female brings her abdomen up to the base of the male’s abdomen forming a mating wheel and fertilization takes place, completing their life cycle.